ne of the many bones of contention between historians who believe the Wright brothers were the first to make a controlled and sustained powered flight and those who put forth other candidates is a contract between the Smithsonian Institution and the Wright Estate. 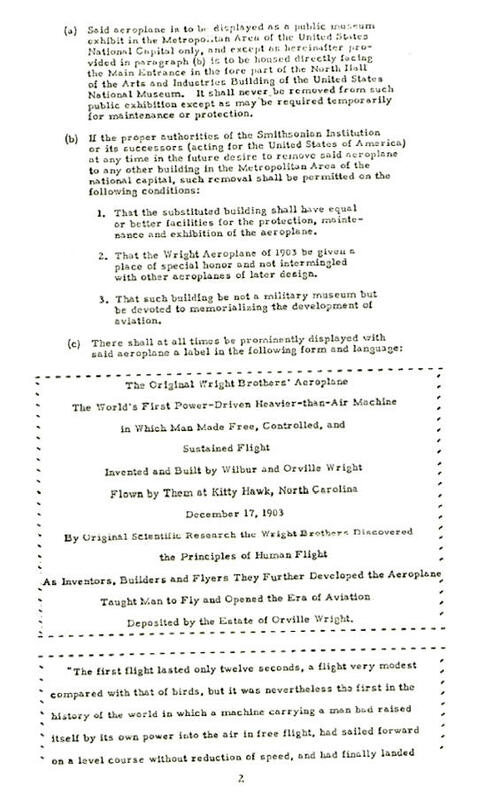 Dated 23 November 1948, almost a year after Orville Wright's death, the agreement was the direct result of the long feud between Orville Wright and the Smithsonian. The two disagreed whether the Wright brothers or Samuel P. Langley, the former Secretary of the Smithsonian, deserved the credit for having developed the first successful aircraft. The resolution of this disagreement defined the meaning of a successful airplane. 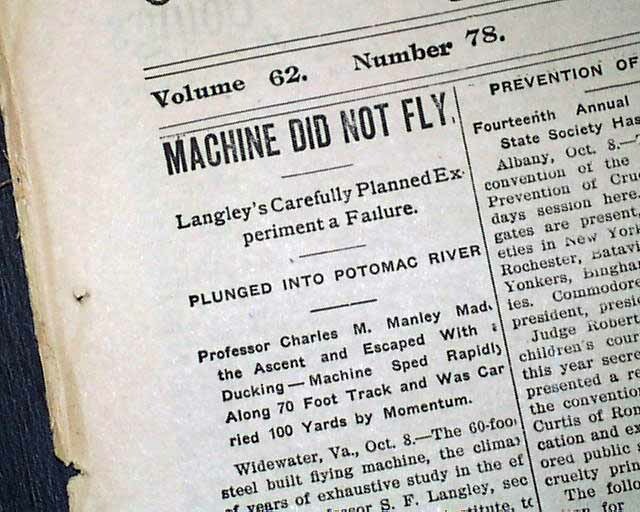 Samuel Langley had been an active experimenter with mechanical flight since the 1880s. In 1896, he flew two large steam-powered aircraft he called "aerodromes" repeatedly for sustained flights of up to 4000 feet (1219 meters). The aircraft were unmanned and uncontrolled, but the flights attracted much attention. 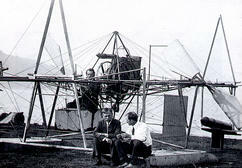 Two years later in 1898, the War Department gave Langley $50,000 to create an aerodrome capable of carrying a man. Langley attempted to fly his "Aerodrome A" twice on 7 October 1903 and 8 December 1903 with Charles Manly as a very brave pilot. 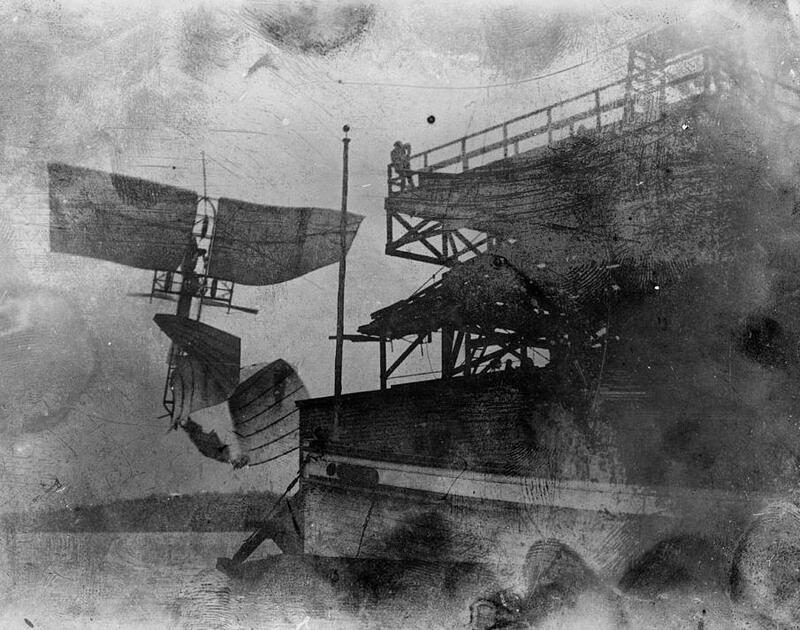 On both occasions Aerodrome A slid into the Potomac River after being catapulted from a houseboat. These were extremely embarrassing moments for the Smithsonian and the War Department, both of whom were ridiculed mercilessly in the press. 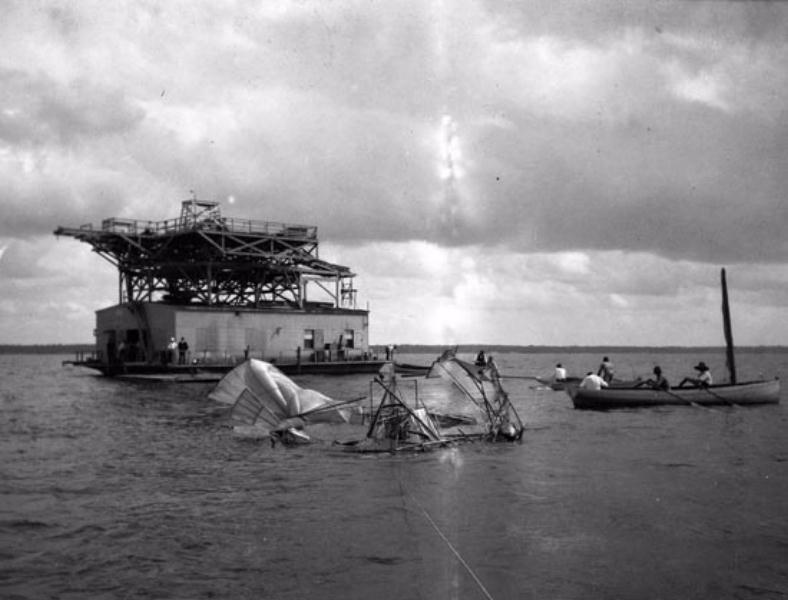 All this took place just before the Wright brothers succeeded in flying on 17 December 1903. In 1906, the Wright brothers were granted a patent for a control system that could steer an aircraft in three axes – roll, pitch, and yaw. 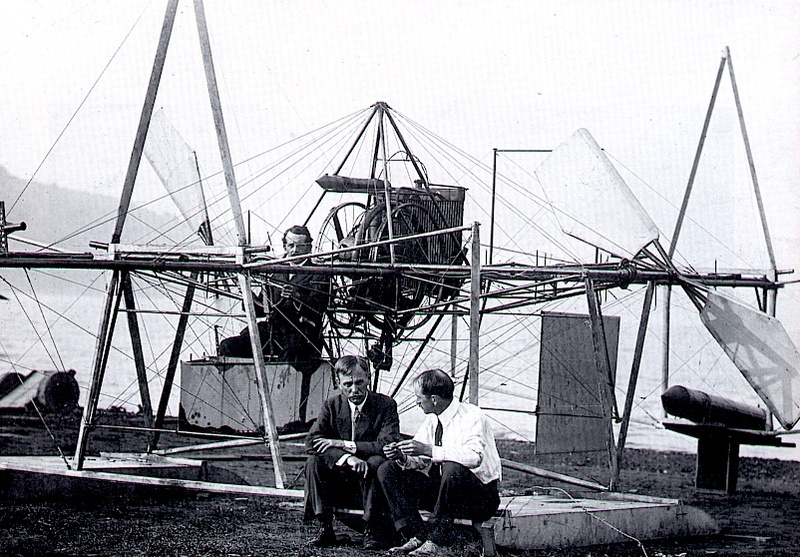 It was not, as many people believe, a patent on the powered airplane. The concept of the fixed-wing airplane had first been proposed in 1799. Alphonse Penaud created a rubber band-powered model which flew successfully in 1871, possibly the first sustained powered airplane flight. But like Langley's later flights, it too was uncontrolled. The first experimenter to successfully control an aircraft was Otto Lilienthal, who made glider flights between 1891 and 1896. However, he controlled his craft by shifting his weight, effecting roll and pitch only. Full three-axis control wasn't achieved until 1902 when the Wright brothers flew a glider with aerodynamic control surfaces. This is what they patented. 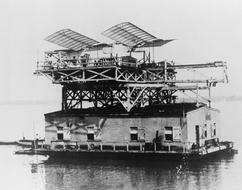 They married their control system to a powered aircraft in 1903 to make the first controlled and sustained powered flights. It was this three-axis aerodynamic control system that other experimenters copied. In 1909, the Wright brothers launched patent suits to protect their intellectual property and their most persistent opponent was Glenn Curtiss. The courts ruled against Curtiss in 1913 and 1914, but he appealed on the grounds that other aircraft could have flown before the Wright Flyer. 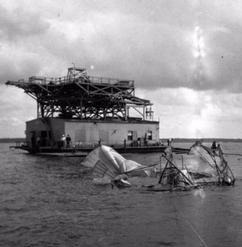 At the same time Charles Walcott, who had taken over the Smithsonian Institution when Langley died, was helping the Smith to rebuild its reputation after the Aerodrome fiasco. 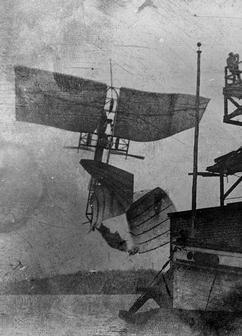 The two men realized that flying the Aerodrome would solve both their problems, and the Smithsonian loaned Curtiss the remains of Langley's Aerodrome A. 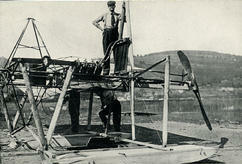 He rebuilt the aircraft making many changes to improve structural strength, lift, power, and controllability. 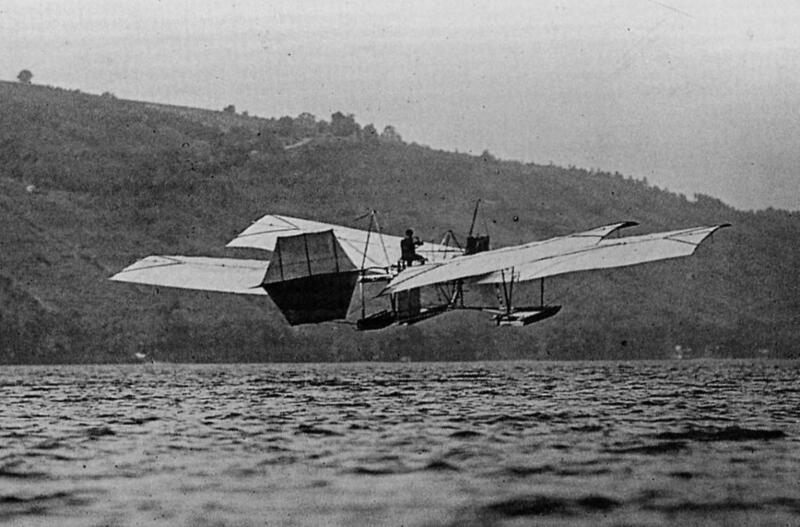 On 28 May 1914, Curtiss made a few hop-flights off the surface of a lake. This ruse had no effect on the patent suit, but it was balm for the bruised egos at the Smithsonian. Upon getting the Aerodrome A back from Curtiss, they proudly displayed the aircraft at the Arts and Industries Building with a plaque that claimed it was the first airplane "capable" of manned flight. Orville was livid and thus began a feud that he eventually won in the courts of public opinion. He sent the 1903 Wright Flyer – considered a national treasure by many – to England to underscore the ridiculous position of the Smithsonian. Even if the Aerodrome A had been "capable" of flight (and later studies would show that it wasn't), it simply hadn't flown in its original condition. To bring the Flyer back, Orville demanded that the Smithsonian apologize and admit the error of their ways. This they finally did in 1942, and in 1943 President Franklin D. Roosevelt, with Orville's assent, announced the Flyer would be returning to America. Unfortunately there was a world war on at the time and no one got around to packing up the airplane and sending it back to America until Orville was deceased. Harold Miller, the husband of Orville's niece and the executor of his estate, thought that something should be done to prevent the Smithsonian from backpedaling. The feud seemed to be over, but it was still fresh in everyone's memory. A change of Secretaries at the Smith and it might be back on. So Miller, on behalf of the Wright Estate, insisted on an agreement with the Smithsonian. 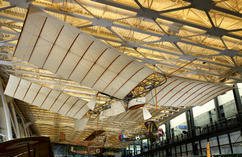 The Wright Flyer would continue to be used as leverage on the side of the angels. 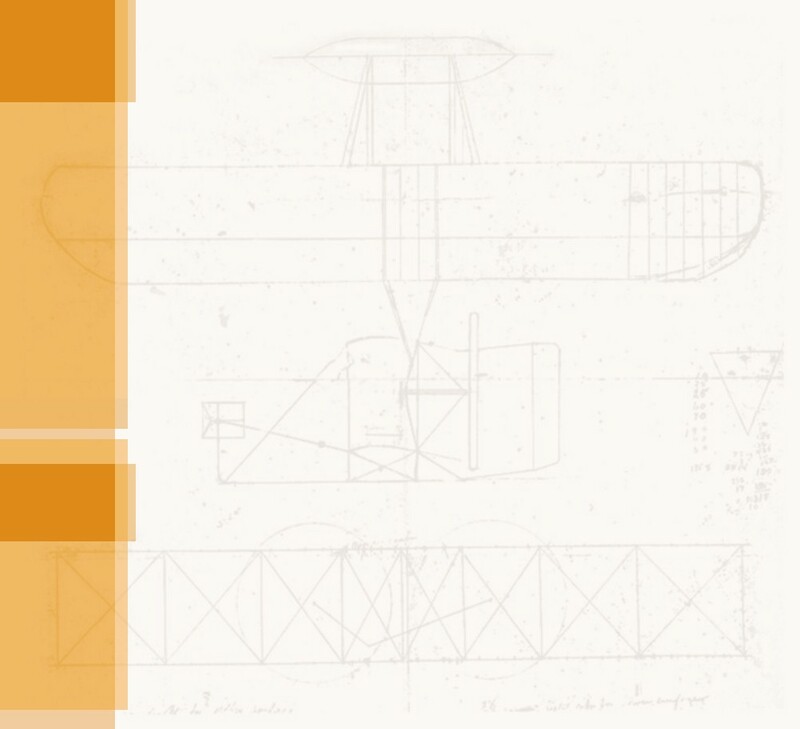 If the Smith ever identified another aircraft as the first to make a controlled, powered manned flight, the Wright heirs could reclaim this national treasure. 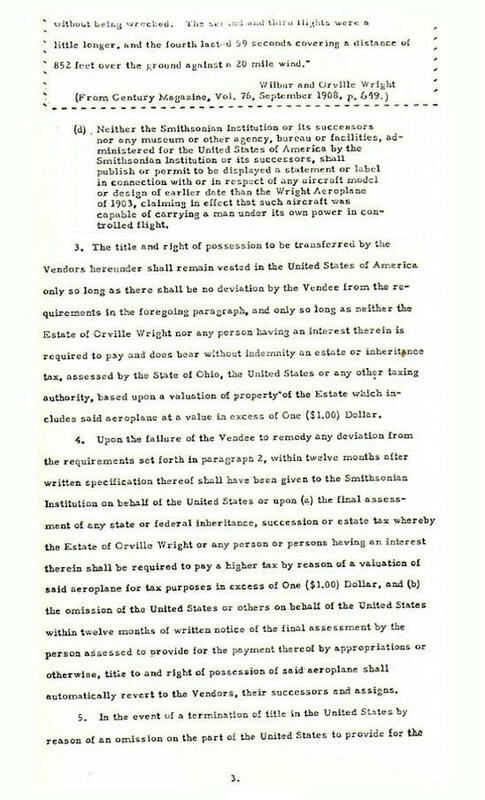 The Estate of Orville Wright agrees to sell the 1903 Wright Flyer to the United States (represented by the Smithsonian) for $1. 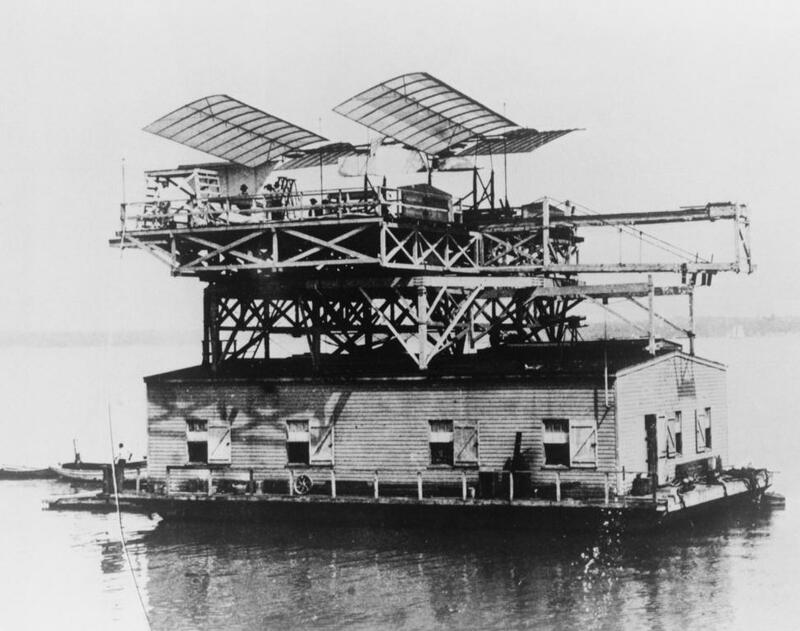 In return, the United States guarantees the aircraft to be displayed prominently in the nation’s capital and to be identified as the first heavier-than-air flying machine in which men made a controlled and powered flight. The airplane is to be valued at $1 for tax purposes. Should the United States not prominently display the airplane, display it without the agreed-upon identification, or identify another airplane as being capable of controlled and powered manned flight before December 17, 1903, the ownership of the airplane reverts to the Estate. Additionally, if the airplane is valued at more than $1 and the Estate is assessed for taxes, the United States will pay those taxes. If it does not, the title reverts. If the United States forfeits its title to the airplane for any of these reasons, it has five years to comply with the agreement to regain title. This was not a clandestine conspiracy as some have claimed. 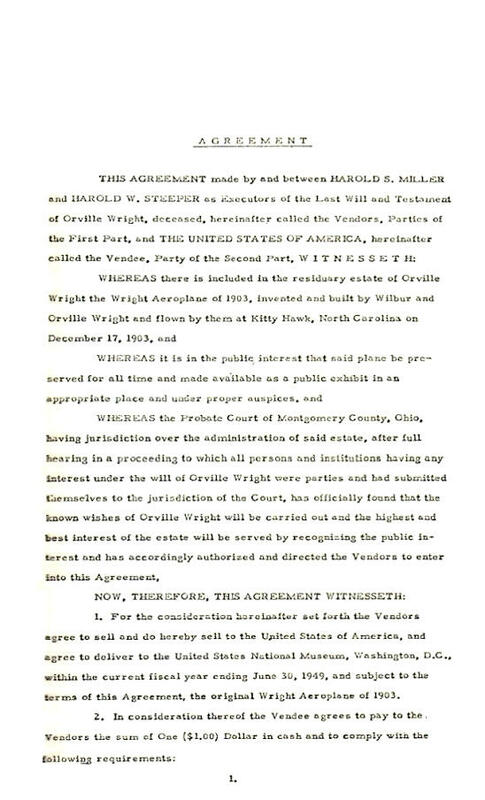 It was entered in the public record when the court of Montgomery County, Ohio probated the Wright estate after Orville's death and it remained public record from that point on. As far as the Smithsonian was concerned, these sorts of agreements are common between museums and donors. The folks who own the Hope Diamond certainly didn't lend it to the Smithsonian with the understanding it might someday be hidden away in the basement. It's a safe bet that the donors and the Smith have an understanding that it will be prominently displayed, it will be properly identified, and that the valuation of the gem will not result in unwarranted taxes. "Neither the Smithsonian Institution or its successors nor any museum or other agency, bureau or facilities, administered for the United States of America by the Smithsonian Institution or its successors, shall publish or permit to be displayed a statement or label in connection with or in respect of any aircraft model or design of earlier date than the Wright Aeroplane of 1903, claiming In effect that such aircraft was capable of carrying a man under its own power in controlled flight." It seems ironclad, but it lacks clarity. The word "capable" of course is a direct poke at the Smith's attempt to promote the Aerodrome A. But the writer does not define "controlled flight" as millions of pilots came to understand it – three-axis control. And there is nothing here that clearly says the aircraft must have sufficient power to sustain flight. Technically, a glider would qualify using Wilbur's own argument that soaring machines have a "gravity engine" for power. There are loopholes here you could fly an airplane through – a poorly-controlled, underpowered airplane. Furthermore, when read in context with the remainder of the agreement, this does not prevent the Smithsonian from investigating alternate versions of aviation history. It simply says that should the Smithsonian take the position that someone other than the Wright brothers made a controlled and powered flight before 17 December 1903, they should be prepared to forfeit the airplane. 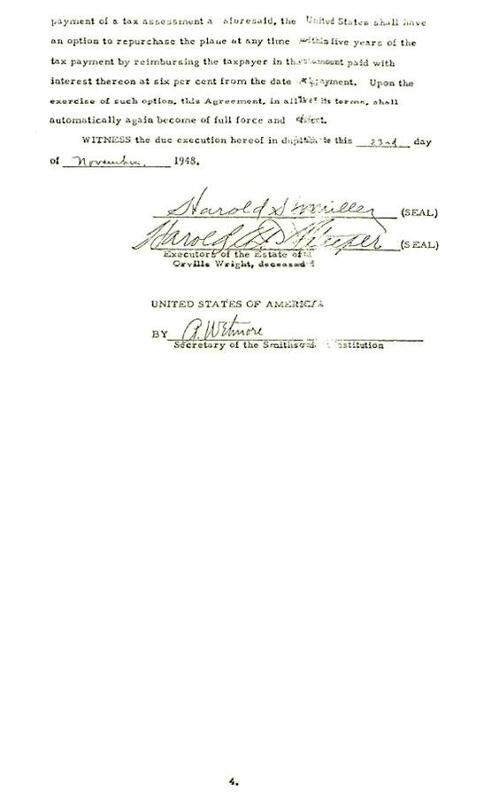 It's also worth noting that this agreement was struck in 1948. For the first half of the twentieth century, the Smithsonian was free to endorse any inventor or any airplane they deemed first to fly. There was certainly enough time to investigate other claims as they came to light. For example, there were 13 years between the time that Randolf and Phillips published the story of Gustave Whitehead in the January 1935 edition of Popular Aviation and the signing of the agreement, during which time the story was investigated by Harvard University and found wanting. Furthermore from 1929 on, the Guggenheim Chair (top dog in the Aviation History section) of the Library of Congress was occupied by Albert F. Zahm, a man who had been highly critical of the Wright brothers since he testified against them in the patent suits of 1909-1913. 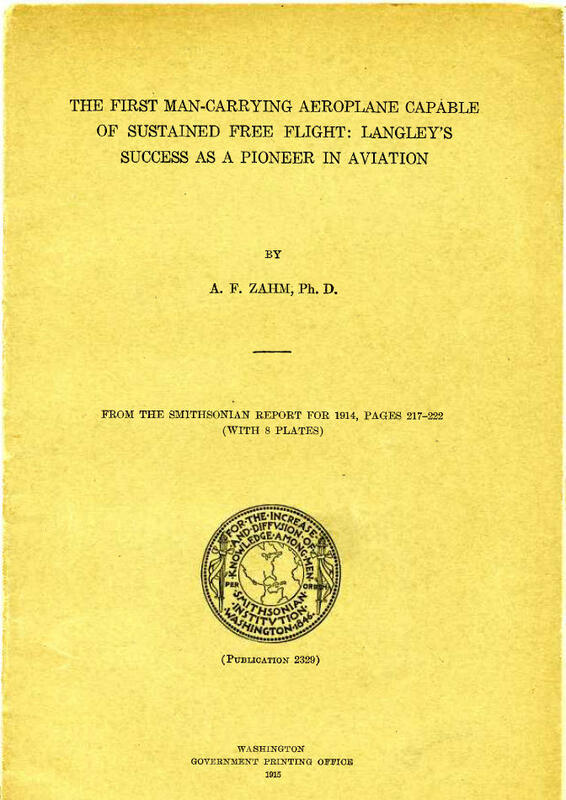 Zahm actively sought information that would negate the Wright brothers' accomplishments. During the end of his career, he even offered a reward for photographic evidence that would prove the Wrights weren't the first to fly. Had he found anything; it certainly would have been passed to the Smithsonian before the agreement was signed. "The contract remains in force today, a healthy reminder of a less than exemplary moment in Smithsonian history. Over the years individuals who argue for other claimants to the honor of having made the first flight have claimed that the contract is secret. It is not. I have sent many copies upon request. Critics have also charged that no Smithsonian staff member would ever be willing to entertain such a possibility and risk losing a national treasure. I can only hope that, should persuasive evidence for a prior flight be presented, my colleagues and I would have the courage and the honesty to admit the new evidence and risk the loss of the Wright Flyer. " We hope so, too, and would applaud their grace under immense pressure. However, perhaps it's time for a change. Langley-inspired politics are no longer a threat to the Wright legacy. There has been no credible challenge to the Wright's title as the first to make a controlled and sustained powered flight for over a century, and there is none now despite recent chest thumping about analysis of photos within old photos. A joint statement from the Smithsonian and the Wright heirs saying that they will consider amending the agreement should someone present credible evidence of ante-Wright flight would affirm public confidence in what most scholars know to be plain, unvarnished aviation history. It would diffuse one of the most often-used arguments against the Wrights' historic status and would send the conspiracy theorists scrambling for another conspiracy. The Wright/Smithsonian Controversy -- A detailed account of the feud between Orville Wright and the Smithsonian Institution, and the events leading up to it. Langley's Aerodrome A mounted on a catapult atop a houseboat afloat in the Potomac River near Quantico, VA.
Workmen assemble the Aerodrome A on its catapult. The wings were considered so fragile, they couldn't be put in place unless the wind was below 5 mph (8 kph). 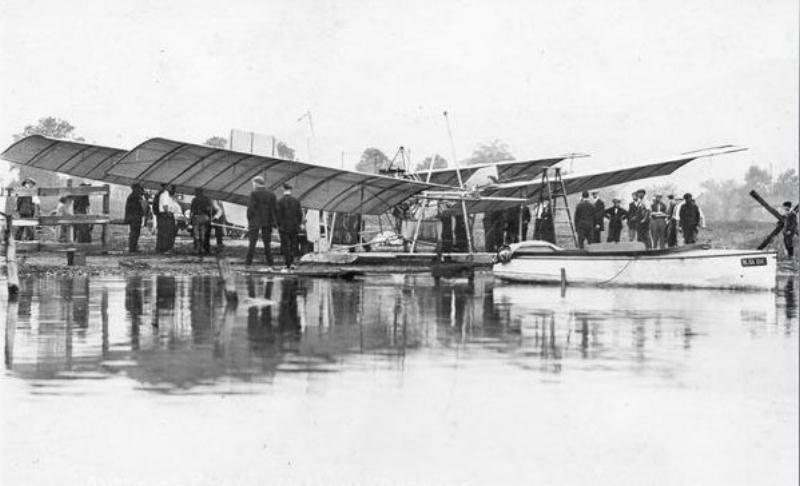 The Aerodrome A drops into the river just after it was launched on 8 December 1903. The rear set of wings collapsed immediately after it left the catapult. The Aerodrome A lies crumpled on the river. Manly, who was wearing a cork life vest, was trapped under the wreckage briefly but escaped unharmed. 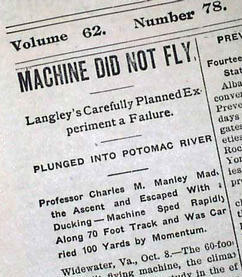 Both of Langley's attempts to fly made the newspapers worldwide. Glenn Curtiss in the newly rebuilt cockpit of the Aerodrome A. Albert Zahm (front left) and Charles Manly (front right) are seated on a pontoon. 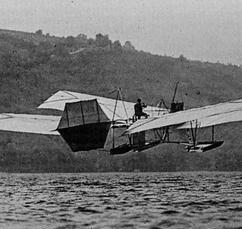 The modified Aerodrome A is towed onto Lake Keuka near Hammondsport, NY. Read more about the 1914-1915 test flights HERE. Among the many modifications made to the Aerodrome A was the addition of a Curtiss V-8 engine and a modern propeller. However, it did make several flights with the original Manly-Balzer engine and Langley propellers. Three separate pilots flew the modified Aerodrome A – Glenn Curtiss, Elwood Doherty, and Walter Johnson. 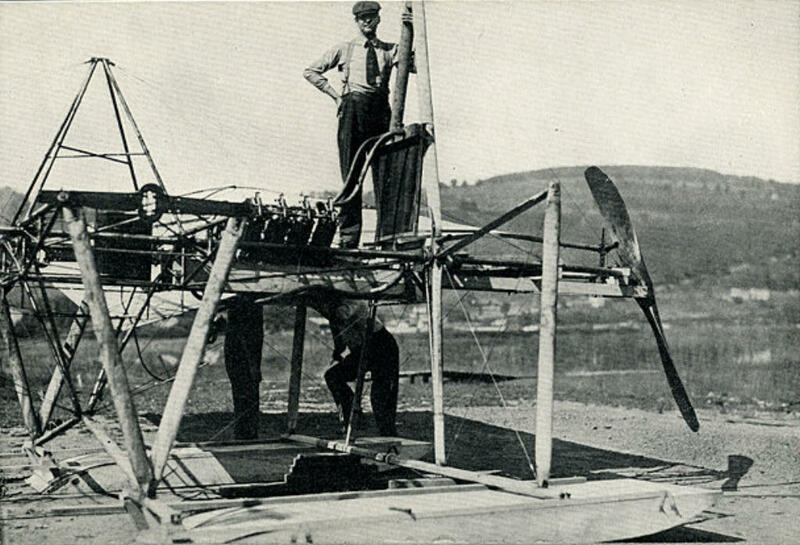 The best flight was about 20 miles (32 kilometers) in a straight line, although with the Manly-Balzer engine the aircraft could only make unsustained hop-flights of 150-200 feet (46-61 meters). 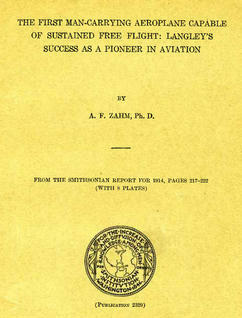 The cover of the 1915 Smithsonian report on Curtiss' test flights of the Aerodrome A, written by Alfred Zahm. Zahm mentioned the modifications, but gave the distinct impression that these were made after the Aerodrome had first been flown in its original configuration. 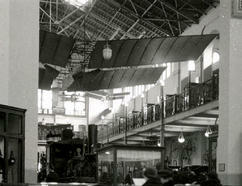 Aerodrome A was returned to its original configuration (without modifications) and installed in the Smithsonian in 1918. The plaque read: "Original Langley Flying Machine, 1903. The first man-carrying airplane in the history of the world capable of sustained free flight..."
Today, Aerodome A is on display at the Smithsonian Air & Space Museum Annex at the Dulles Airport in Virginia. 1. 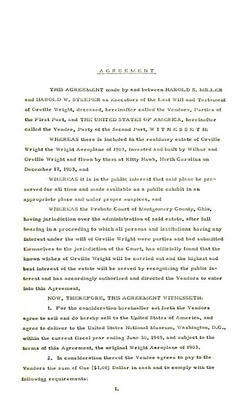 For the consideration hereinafter set forth the Vendors agree to sell and do hereby sell to the United States of America, and agree to deliver to the United States National Museum, Washington, D.C., within the current fiscal year ending June 30, 1949, and subject to the terms of this Agreement, the original Wright Aeroplane of 1903. (a) Said aeroplane is to be displayed in a public museum exhibit in the Metropolitan Area of the United States National Capitol only, and except as hereinafter provided in paragraph (b) to be housed directly facing the main entrance in the fore part of the North Hall of the Arts and Industries Building of the United States National Museum. It shall never be removed from such public exhibition except as may be required temporarily for maintenance and protection. (1) That the substituted building shall have equal or better facilities for the protection, maintenance and exhibition of the aeroplane. (2) That the Wright Aeroplane Of 1903 be given a place of special honor and not intermingled with other aeroplanes of later design. (3) That such building be not a military museum but be devoted to memorializing the development of Aviation. Taught Man to Fly and Opened the Era of Aviation. (d) Neither the Smithsonian Institution or its successors nor any museum or other agency, bureau or facilities, administered for the United States of America by the Smithsonian Institution or its successors, shall publish or permit to be displayed a statement or label in connection with or in respect of any aircraft model or design of earlier date than the Wright Aeroplane of 1903, claiming In effect that such aircraft was capable of carrying a. man under its own power in controlled flight. 3. 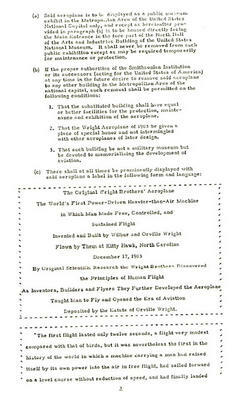 The title and right of possession to be transferred by the Vendors hereunder shall remain vested in the United States of America only so long as there shall be no deviation by the Vendee from the requirements in the foregoing paragraph, and only so long as neither the Estate of Orville Wright nor any person having an interest therein is required to pay and does bear without indemnity an estate or inheritance tax, assessed by the State of Ohio, the United States or any other taxing authority, based upon a valuation of property of the Estate which includes said aeroplane at a value in excess of One ($1.00) Dollar. 4. 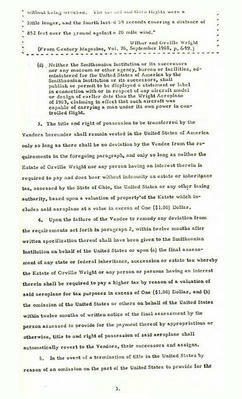 Upon the failure of the Vendee to remedy any deviation from the requirements set forth in paragraph 2, within twelve months after written specification thereof shall have been given to the Smithsonian Institution on behalf of the United States or upon (a) the final assessment of any state or federal inheritance, succession or estate tax whereby the Estate of Orville Wright or any person or persons having an interest therein shall be required to pay a higher tax by reason of a valuation of said aeroplane for tax purposes in excess of One ($1.00) Dollar, and (b) the omission of the United States or others on behalf of the United Slates within twelve months of written notice of the final assessment by the person assessed to provide for the payment thereof by appropriations or otherwise, title to and right of possession of said aeroplane shall automatically revert to the Vendors, their successors and assigns. 5. In the event of a termination of title in the United States by reason of an omission on the part of the United States to provide for that In the event of a termination of title in the United States by reason of an omission on the part of the United States to provide for the payment of a tax assessment a aforesaid, the United States shave have the option to repurchase the plane at any time with five years of the tax payment by reimbursing the taxpayer in the amount paid with interest thereon at six per cent from the date of payment. Upon the exercise of such option, this Agreement, in all of its terms shall automatically again become of full force and effect. Witness the due execution thereof here in duplicate this 23rd day of November, 1948. 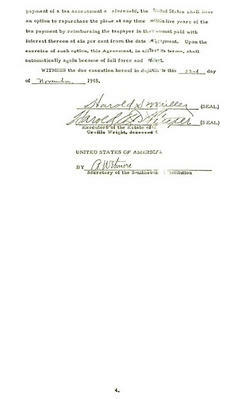 Page 1 of the original contract. Just Whose Conspiracy Is This? – The Wright/Smithsonian Agreement is most often used by supporters of Gustave Whitehead as evidence of a conspiracy to deny Whitehead his place in history. Stella Randolph and William O'Dwyer wrote a book on this subject, History by Contract, in 1978. But when it was recently discovered that access to Whitehead's papers and memorabilia are restricted to supporters only, the smell of conspiracy seemed to be coming from another direction. Text and analysis of the contract between the Wright Estate and the Smithsonian Institution.